When EPCOT Center opened in 1982, the pavilions and attractions available to guests were only the beginning of what they would be able to experience in the years that followed. New pavilions were planned and even advertised, yet very few of those plans would actually come to fruition. One space that did see its planned expansion through to completion was the China Pavilion. 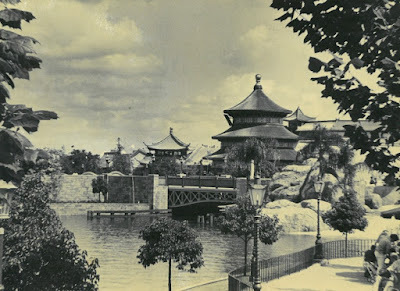 Part of the original mission of World Showcase was for the cultural representatives to recreate “the rich traditions of their homelands, and share their art and architecture, culture and cuisine.” This was to be the true treasure of each pavilion, and within China the central themes was serenity and contemplation. From the stones near the Gate of the Golden Sun, to the lotus pool, and even the film, originally titled Wonders of China, were designed in encourage both of these sentiments. However, the ability to walk out of the film and through a bustling street filled with ornate details to consider, have a meal in a quiet, elegant setting, or even peruse wares in the House of Good Fortune were options not available to guests in the early years of the pavilion. From this 1982 photo you can see the Temple of Heaven, the lush greenery of the lotus pond, and China’s art gallery, the House of the Whispering Willow, but that’s where the story ends for the pavilion until 1985. It would take three years from the opening of EPCOT Center for Lotus Blossom Cafe, Nine Dragons Restaurant, House of Good Fortune, and the facades of tiny homes and businesses that flesh out the rest of China’s story to become a reality. This would be a rarity for those early plans of EPCOT Center, but one that has delighted guests for more than three decades. As Richard Beard said of the China experience, “a spot of contemplation will help you to absorb the amazing sights and sounds you have experienced here, and the inner serenity it induces many be the most valuable item you’ll carry away with you.” It may seem like a simple sentiment, but these are words that ring true to this very day.